This oceanfront beach house is for a fabulous family (or multi-family) holiday. A new extension was completed in February 2015 that adds a master bedroom suite, office/study, formal dining room, powder room, elevator, and 2-car garage. This 6-Bedroom (sleeps 12), 6.5 Bath (5 en suite) home has private access to sensational, uncrowded beach and a large private swimming pool. 10MB cable wireless broadband for Internet access is available, as well as a multiple flat-panel HDTVs. Located in Sea Pines Plantation, home of the PGA Heritage Golf Classic (Harbour Town golf links) and former site of the Family Circle Tennis Classic (one of top 4 US tennis tournaments), this area has miles of paths for biking, walking, rollerblading. There is also great boating if you are seeking a change of pace. Guests have free tennis privileges daily (one hour + additional time after 1pm if you use the hour in the morning) at the nearby South Beach Racquet Club. Guests also have access to and/or discounted rates at many of the island's golf courses including Harbour Town. • Storage for floats, beach chairs, etc. • Watersports of every type -- boating, fishing, sailing, etc. Area: Hilton Head is an island just off the coast of the southeast United States midway between Washington, DC and Miami, Florida. Our house has been in the Leavitt family since Ted's father bought the property from Charles Fraser on a hunting trip in the early 1960s. We bought the house in 1998 and then did a complete renovation in order to bring the house up to date. The old beach houses were very open (you had to go outside to the downstairs bedroom!) and we converted it to a 5-bedroom, 5-bath format, while maintaining the character from the early days of Sea Pines. In 2014/2015, we did a major extension to add some of the features we've really wanted to over the years. This has given us a nice master suite, some proper garages, elevator, office/study and a dining room for entertaining the entire group that is there. 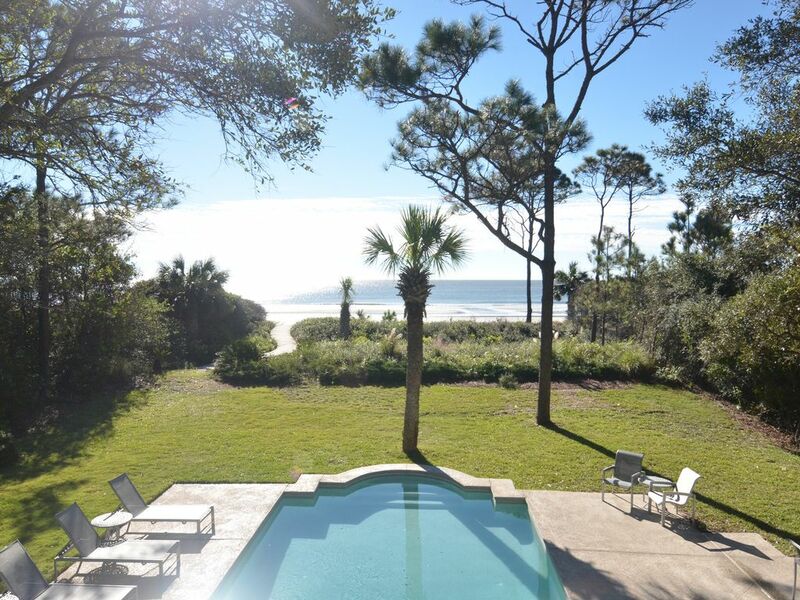 Having come to Hilton Head since 1962, our house reflects the dichotomy of a modern version of an original Sea Pines beach cottage with the simplicity of beach life. We personally feel the privacy of our setting is a unique benefit, but each person will have their own viewpoint. Complimentary WiFi and wireless printer. There are two separate dining areas -- an informal one in open area next to kitchen seating 10+ and a more formal dining room seating 14+. A collection to read from. Elevator goes from garage to 2nd floor. The first floor is accessed directly from the drive, not the elevator. Longer-term rentals are typical in January - March. There are some shorter-term stays, e.g. 4 nights, in Oct.-Feb. The house was perfect for our family gathering Each bedroom has its own bathroom which makes everything easier. The ocean view from the deck is exactly what we wanted. The kitchen is fully stocked with everything you could possible need. There was nothing more we could have asked for that wasn’t already there. The owner is really prompt with an email response to every question we had. We rented this beautiful home for a family celebration and had a wonderful time! The house was perfect and the owner was great to work with. Perfect spot for old high school friends to gather. We had a blast! 22 Black Skimmer was the perfect location for our 2 family Fall Break. The beach is gorgeous , the home clean and comfortable . The kids loved having the option of the pool and beach. Plenty of room for all to spread out, and big spaces to come together as well! Garage and elevator entry most convenient for luggage, groceries etc. We have been coming to Hilton Head as an extended family for 10+ years, and this house was by far our favorite. You cannot beat the location and common areas of the home. Owner is extremely responsive, and a pleasure. Highly recommend! Golf: Specifically, it is on the border of the states of South Carolina and Georgia. The two closest airports are Hilton Head (HHH, which is serviced by US Airways via Charlotte, North Carolina connections) and Savannah, Georgia (SAV, which is serviced by Delta, Continental and others via Atlanta and New York). Our house is 50 minutes from Savannah and 20 minutes from the Hilton Head airport. Note that we are an owner-managed property and the only extra we charge is $69 in lieu of a security deposit. Homeaway and VRBO instituted a sliding-scale service fee in February 2016 that relates to booking on their site. We, the owners, have nothing to do with this.